Passe uma tarde desfrutando de duas das melhores coisas para fazer em Paris - vagando pelas ruas de paralelepípedos de Montmartre e admirando as obras-primas artísticas do Louvre. Com um guia, você explorará o bairro historicamente boêmio de Montmartre, onde artistas como Picasso costumavam morar e trabalhar. Um passeio funicular está incluído para chegar ao topo da colina, onde você pode visitar a Basilique du Sacré-Coeur. Em seguida, dirija-se ao Louvre, onde você tem entrada sem fila para ir direto para dentro e ver obras de Leonardo da Vinci e outros grandes artistas. Sua excursão de meio dia começa em um local central em Paris, onde você encontrará seu guia e embarcará em seu ônibus ou microônibus. 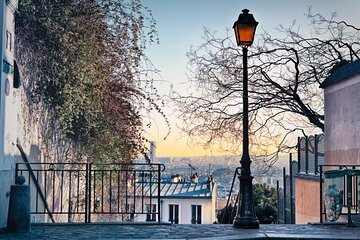 Siga para o norte até Montmartre, no 18º arrondissement, e caminhe por este bairro animado e charmoso com seu guia. Saiba mais sobre a rica história de Montmartre, que data de muitos séculos e inclui a época em que artistas como Monet, Dalí, Picasso e Van Gogh viveram, trabalharam e socializaram aqui. Suba no funicular para subir até o topo da colina, onde você pode admirar uma vista panorâmica da cidade. Em seguida, dirija-se à Basilique du Sacré-Coeur, conhecida por sua arquitetura românica e bizantina. Você tem tempo para explorar a basílica por conta própria antes de retornar ao ônibus para o passeio ao Louvre. Quando você chegar, passe pela fila de ingressos com sua entrada sem fila e siga seu guia pelos corredores estimados deste museu de renome mundial. Veja suas peças mais conhecidas, como a Mona Lisa de Leonardo da Vinci e Vênus de Milo, uma antiga estátua grega, e maravilhe-se com outras obras como Liberty's Leading the People, de Delacroix, e The Raft of the Medusa, de Géricault. Quando sua visita guiada ao Louvre termina, você é livre para ficar no museu por conta própria para continuar explorando seus tesouros, ou retornar ao seu ponto de partida original no ônibus da turnê. (Nota: Às quartas e sextas-feiras, o Louvre fica aberto mais tarde; nesses dias, é possível ficar até as 21h45, sem custo adicional). Really a very nice combination tour, I would have liked to see the inside of the basilica with a skip the line entrance there as well. As it was there was not enough time to see inside with how long the wait was. But still a very nice tour, my guide was knowledgeable and had a fresh way of delivering information to keep things interesting. I would suggest to anyone to take the tour on a Friday when the Louvre is open later so you can wander and marvel to your hearts content. My family and I were very disappointed in the tour overall. There were several problems: The busses were extremely largewanting to pack as many people as they possibly can so it was very challenging driving through most of the tiny street of paris. The tour guide, although seemed like a nice person, was not very knowledgable of the museum exhibit and we could only understand 20 of what she was saying due to a very heavy accent along with horrible headsets. The checking in process was even worse. Terrible customer service. The man inside the agency was yelling and screaming at people. I would not recommend This company CityTour. They try to pack as many tourist as they can and shove them in different groups. Overall, I would never use this company again!! Best tour I took in Paris. Our tour guide was wonderfully informative and took us to some interesting sites of Montmartre. The Louvre tour hit the main highlights. No line to wait in we walked right in. We booked the tour for a Friday. The Louvre closes at 9:45 pm on Fridays, so after the guided portion of the tour was over, we had time to explore on our own for a few hours. Viator should consider re-evaluating the relationship with this vendor. After printing out our ticket from our Viator confirmation we were instructed to exchange at an incredibly busy tour office for other tickets for some reason. Everyone in office was unfriendly and unhelpful. At the front of the line, we tried to approach a ticketing desk and were yelled at by a woman NO! GET BACK BEHIND THE LINE!. This was the ONLY rude experience we had in the entire trip to Paris - a terrible way to start. The tour itself was okay. On the way there, there was little commentary besides the importance of getting to the bus on-time although we passed directly by the Opera house - no commentary. We got very little information in Montmartre from the tour guide and we actually lost a portion of the tour group because it was super busy and she seemed to not care if anyone was able to keep up. Instead of looking for them, she asked those still present to remind them to come back to the bus on-time and left. Very little information on the Sacre Coeur which we toured on our own best part - do not miss. The bus was fine and the bus driver was friendly. The Louvre tour was much better - if we had skipped the horrible tour office and weird time in Montmartre and spent the whole time at the Louvre, we would have given a better review. Viator - consider taking this tour in-house as our tour directly through your company was MUCH better. Great tour, lots to see and great access to the Louvre. The tour guides did not make any effort to interact with the group though, they just seemed to run through their script. We started with the tour of Montmartre and heard lots of interesting facts from our guide, Jean Louis. The funicular ride is a must especially for people who will be challenged by the uphill climb to the Basilica Sacre Coeur. Next, was our Louvre Museum tour which Jean Louie expertly navigated and pointed out the most important artworks. We will never forget Jean Louie he is very engaging and animated and made the whole tour fun. It was a plus to take this tour on a Friday since the museum closes late and you can stay longer after the tour if one wishes. Netter deutschsprechender Guide Vincent. Sehr interessante Führung sowohl zu den Sehenswürdigkeiten in Montmartre als auch zu den Highlights des Louvre. This was an excellent tour. Our guide made the event fun and told us a lot about the artists where they lived etc.We got to spend a lot of time at the Louvre after the tour was over and explore it on our own.